KE00005 is a solid phase sandwich Enzyme Linked-Immuno-Sorbent Assay (Sandwich ELISA). 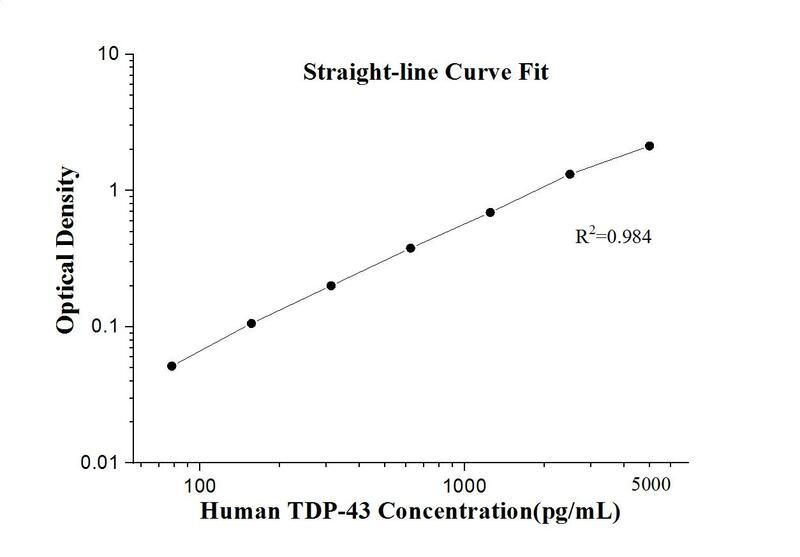 The TDP-43 ELISA kit is to be used to detect and quantify protein levels of endogenous TDP-43. The assay recognizes human TDP-43. A polyclonal antibody specific for TDP-43 has been pre-coated onto the microwells. The TDP-43 protein in samples is captured by the coated antibody after incubation. Following extensive washing, a monoclonal antibody specific for TDP-43 is added to detect the captured TDP-43 protein. For signal development, horseradish peroxidase (HRP)-conjugated antibody is added, followed by Tetramethyl-benzidine (TMB) reagent. Solution containing sulfuric acid is used to stop color development and the color intensity which is proportional to the quantity of bound protein is measurable at 450nm with the correction wavelength set at 630 nm. represses HIV-1 transcription. It was also reported to regulate alternate splicing of the CFTR gene. Neumann et al. (2006) found that a hyperphosphorylated, ubiquitinated, and cleaved form of TARDBP, known as pathologic TDP43, is the major disease protein in ubiquitin-positive, tau-, and alpha-synuclein-negative frontotemporal dementia (FTLD-U) and in Amyotrophic lateral sclerosis (ALS). This kit is used to quantify TDP-43 level in vivo. TDP-43 levels are higher in platelets from patients with sporadic amyotrophic lateral sclerosis than in healthy controls.